RV Workamping is a great way to earn extra money while traveling in your RV. Over the course of years, RV’ers have found that employers are always looking for that “temporary” help for a season, cover vacations or their just extra busy for a period of time. These employers could be campgrounds, marinas, restaurants, hotels, Christmas tree or pumpkin farms, resorts, big distribution centers, etc. In many cases, they don’t want to do a permanent hire – just fill a temporary need! Amazon hires thousands of temporary Workampers every fall to help in their big Distribution Centers. It's hard work, but you get a free site and paid great hourly wages for every hour worked. This type of living/employing has become a great help to both the employer and the Rv’er. It probably started years ago with an Rv’er trying to get a campground site for “free” or a reduced rate! They would ask to work a few hours a day and cover their campsite fee. Next thing you know – RV Workamping is a big business! The most prominent “Website/Company” for this type of work is – Workamper.com (Workamper News in Arkansas). They have a great Website that allows employers to post their ads while the RV’er can post their own “situation wanted” ad - It’s a win/win for everyone. The membership is very economical, while the benefits are great. You can even have the latest daily job opportunities emailed to you every day while on the road. Today’s great technology allows both sides to find each other quickly, respond to an ad and interview within a few hours. Years ago, this would all be by word of mouth, or perhaps a newsletter – but even that was difficult to get if you’re traveling! Several other companies have websites to help RV’ers find jobs. Many employers also now will have a “temp job” area, right on their websites. Obviously, RV jobs are plentiful - just takes a little planing and your working! Nowadays, an RV Workamper will not only seek and get a job in pretty much any state, but, they can also arrange for a site for their RV. Depending on the circumstances, many employers either have or pay for the RV’er campsite and most, if not all of their utilities - Again, a win/win for everyone! Each arrangement will be different – some provide only the site, some the site and wages, some just wages. You won’t get rich while doing this – but, you’ll cover your expenses, earn some money and be traveling as all RV’ers love to do! When the job ends, the RV’er packs up and moves on to their next opportunity, relaxes for a while or just travels till they find another job - a great way to see America! Here's an incredible opportunity! 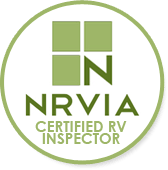 Workamper News formed a company called NRVIA and RV Inspection (.com). NRVIA is a super organization. They train you how to be an RV Inspector and make sure you have the Ethical Standards also. Then, they help you find work as an RV Inspector. They go that step beyond as well - they provide excellent sources of Business planning as well - a win-win for your traveling Rv'er! We took the course and really enjoyed learning even more! We love RV'ing and RV Workamping - but, we need to earn a real living to enjoy it! First Financial donates a portion of their profits earned from processing that merchant's credit cards to that merchant's favorite charity!! First Financial donates to over 500+ Different CHARITIES every quarter on behalf of it's merchant clients!! Have A Passion About Something? Many of us have had a "career" for years, gone to work and come home day after day. Perhaps, all that special knowledge could be converted to an eBook? If you read "About Us", you'll understand why we like Solo Build It so much! They've really outperformed themselves and are providing us with a great source of extra income. Take a look at this link right below - everyone says they can't write - guess what, many of us can!! Better yet, you can do RV Workamping from the comfort of your RV - anywhere! !